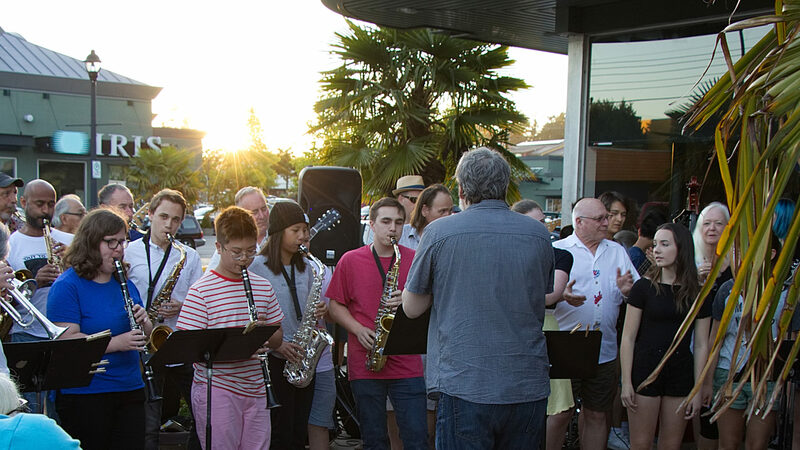 Delta Community Music School, like everyone else has lost the financial support of the Goverment of BC with cutting of the Direct Access grants from Gaming. We have been receiving this grant for many years, in fact it is the only support we receive from any level of Government; municipal, provincial or federal. Last year we received about $18,000, which amounts to about 8% of our operating costs. While none of those funds goes directly into operating this program, those funds do go towards the operating costs of the school, which include our studios, utilities, admin staff, and the like. So indirectly those cuts will effect the operation of the of our summer jazz program as well. I have been hearing a lot of complaints lately about how artists are all “lazy bums” who live off of grants like welfare recipients. I hear complaints about how artists are not really that important. I hear that if we were any good we would be famous like Madonna or Avril Lavigne and would have multi-million dollar recording contracts before the end of puberty. Our CD’s would be available at WalMart. I hear that investing in us is just a waste of time. We are all bottom feeders sucking up government money like welfare bums that live on free handouts when we should all have “real ” jobs, like delivering piazza or driving a truck. What seems to missing from the diatribe is some inkling of truth. The truth here is that thousands of grass roots arts, dance, youth, sports, and education organizations throughout British Columbia have had their grants removed. For most of us this little bit of money – maybe 5 – 20% of operating costs is the difference between existing and not existing. It is the difference between keeping our costs down or having to charge 10 – 15% more. So who benefits from funding arts councils, youth groups, schools, play grounds, violin lessons, soccer teams, and hockey? Families. our social fabric; and this notion that I was brought up with that if you live in Canada, no matter who you are, you will have a chance. If your parents are rich, you have a chance to do something with your life and make a success. If you are middle income you still have a chance to do something with your life and make a success, and make a better life than your parents had. If you are poor, you can still go to school, have a doctor, pay an affordable fee to play on the baseball team or take a piano lesson. To me, that is what living in Canada means. Glorious and Free. Canada means if you are poor you still can have a chance. If you immigrate to Canada you can still come here, work hard and have a chance to succeed and become successful, then help make Canada a success in itself. These grants of a few dollars here and a few dollars there are our investment in what Canada is, and what British Columbia is. These grants allow the program costs to be affordable to anyone who feels the desire to partake. For me this is what it means to live in a “free country”. Canada ; a land of opportunity. Without the grants, then we are a society of those who have, and those who have not. Only the rich can afford the better education at the private school, ballet and dance class, early morning hockey practice, violin lessons after school, and to travel with the band to the festival. The rest of us need not apply. This is not my Canada. My country is a place where anyone who has the desire, makes the effort to develop their talents can have the right to work hard and develop those talents. We have a birth right to succeed if we decide we want to work hard and invest in ourselves to become better citizens. That is my Canada. What these grants and community investments in social profit organizations do is help level the playing field. It is like asking why we have universal health care? These grants do not make artists rich. Most of these grants do not even go to artists, they go to community organizations so that they can keep costs affordable to a greater percentage of the population at large. What is happening to British Columbia right now with all these cuts, well – this is not my Canada. The country I grew up in would not do this. The most important investment any nation can make is an investment in itself, in its citizens, and in its own liberty. . Without that, what are we? Who are we, and what do our actions say about us?